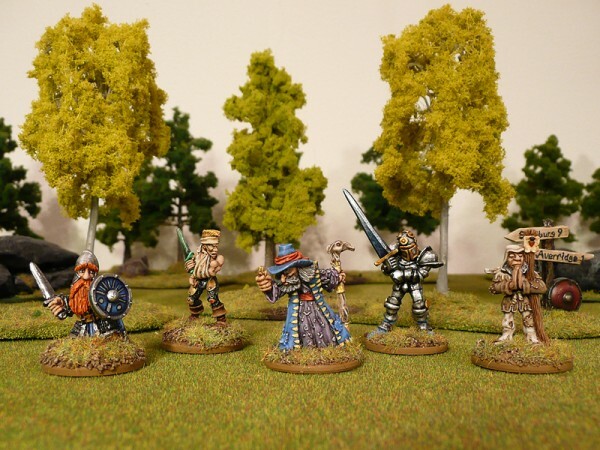 These guys are a motley bunch of potential allies for the heroes in our Songs of Stillburg campaign. I entered them as my team for round 1 of LPL6 and managed to score a win. 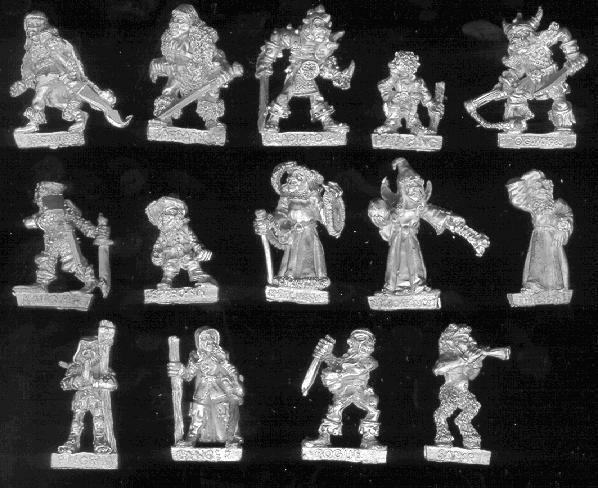 From left to right we have a dwarf sculpted by the Perry brothers (can’t pin point him in a catalogue, but late 80s), an elf wardancer (by Jes Goodwin), a human wizard (Aygar Mistletaine v2 from the Magnificent Sven scenario, probably sculpted by the Perries), a human warrior (a Lord of Battle, classic Jes Goodwin) and finally the Talisman Pilgrim sculpted by Aly Morisson. I’ll post individual bios for each of them over the next few days. Great job on these guys and congrats on your win. Without any disrespect intended to you, I think that the final score was not indicative of the relative quality of both entries: the other entry was great too. Sometimes I love to paint old figures like these but then I occasionally try to paint one that is so full of dodgy sculpting and heinous casting problems that the rose tinted glasses come off. Were these figures problematic due to there age? They look fantastic now, but did you have to put in a lot of extra work to get them to that level? They weren’t too bad. The dwarf has a pretty nasty moldline across the helmet that I didn’t manage to get rid of. The guys in round 2 were worse, but as you said – more on that later. =) The back of Aygar Mistletaine is a horrible mess due to over detailing, I’ll show that in the individual shots. Fully agree, I think the fact that I had a sharper photo helped me out. The other team was equally well painted. Yet more zombies… This week I have mostly been getting… a minstrel!